Another weekend | Carnahan & Sons, Inc. The calendar is marching right along– January down, and already nearing mid-February. Tonight, Pat and I are traveling to Purdue to see the Boilermakers play Nebraska. Looking forward to the game, but it’ll be a late night…the game starts at 830! It may be hard to get up Sunday morning, but it’s all good. Th weather has made for a little bit of a crazy week here. Last week brought us below-zero temperatures. Reading on the pickup dash at -1ºF! 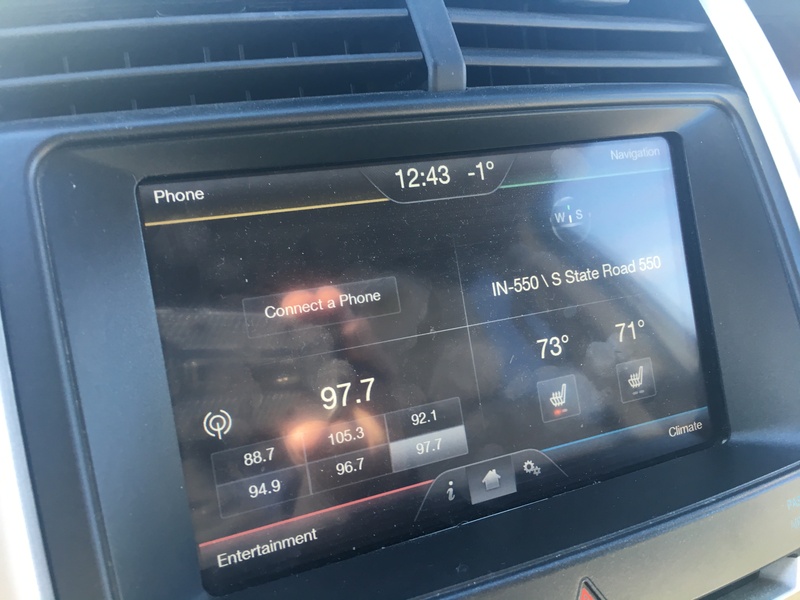 Then on Thursday, we hit 65ºF, and later that night it was 15! Crazy weather…there was even a Category Zero tornado touch down in Knox County, south of Vincennes, on that warm day. It also brought heavy rainfall, not an extraordinary amount, 3.3″ (84mm), but it came in about an hour. Thunder and lightning accompanied the rain. So there were many streets and county roads flooded. You had to be careful where you traveled, and often there were times when you had to turn around and find an alternate route on our county roads! I’ve been dealing with another man-cold this week. It started Monday evening, and I eventually gave up to go to the doctor on that rainy Thursday. At least it was warm outside. After receiving a shot and 3 prescriptions, I am feeling better today. I can breathe easy again! I usually have the man-cold once per winter, but this year, I’m recuperating from my third bout with it. Brandon has been away this week at a special horse show in Texas. He had some success on his trip out there. Grain deliveries resumed Friday. Lots to get moved out this month. 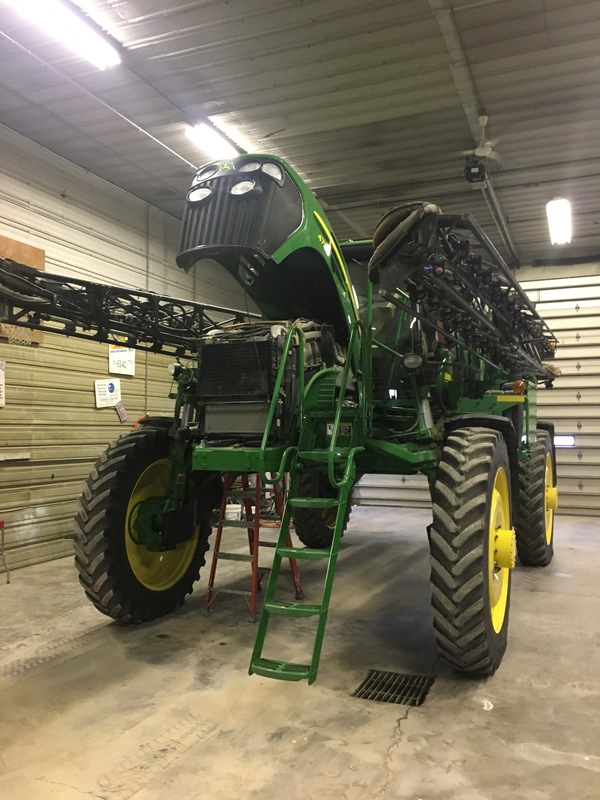 John brought the sprayer into the shop this week for some maintenance– oil filter changes and lubrication. It’s ready for another season of performance. It is our most-used machine, covering our acres multiple times per season. Its readiness is critical; some applications have mere hours for window of opportunity, so this one must be ready. Our South Knox girls’ basketball team won their sectional and are competing at the regional today. Go Spartans! Next week is the National Farm Machinery Show (NFMS) in Louisville, Kentucky. Not sure if we will go this year, but it is always a great show. Some day, I’d like to take in the Commodity Classic. It’s in Orlando this year… and would give us a good excuse to visit WDW again! Th sun is shining today, bright and beautiful. The temperature is a chilly 28F, but with no wind, it is pleasant out there. This entry was posted in Family Life, News and tagged Commodity Classic, JD 4730 sprayer, NFMS, south knox. Bookmark the permalink.